C1398. LEOPOLD STOKOWSKI Cond. Boston S.O. : DON GIOVANNI - Overture (Mozart); Symphony #7 in A (Beethoven); HAMLET - Overture-Fantasia (Tschaikowsky) & BORIS GODUNOV - Symphonic Synthesis (Moussorgsky). (Canada) St Laurent Studio YSL T-306, Live Performance, 13 Jan., 1968, Symphony Hall, Boston. Transfers by Yves St Laurent. 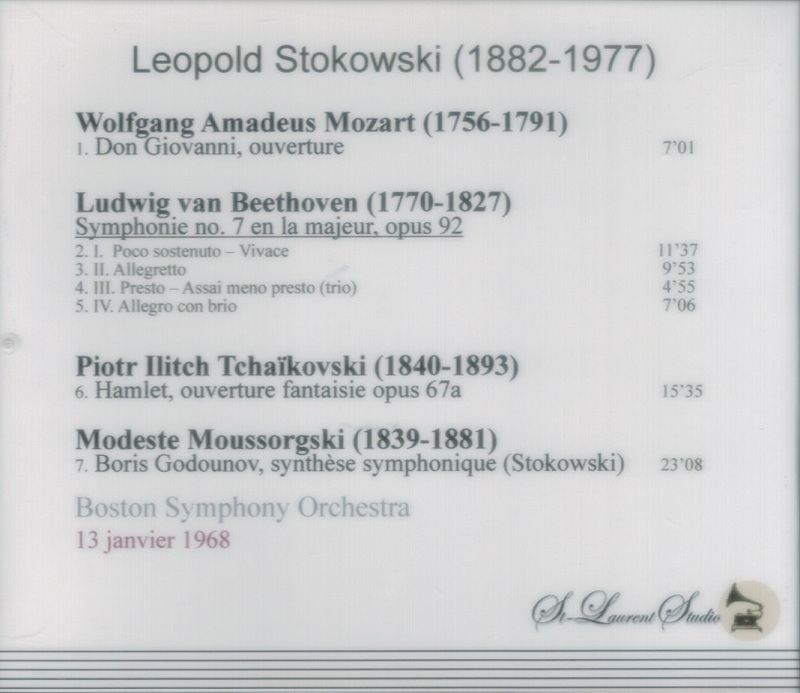 “Leopold Stokowski, possibly the best known symphonic conductor of all time, who came to fame as conductor of the Philadelphia Orchestra, had a career that spanned more than 70 years and, it has been estimated more than 7,000 concerts. 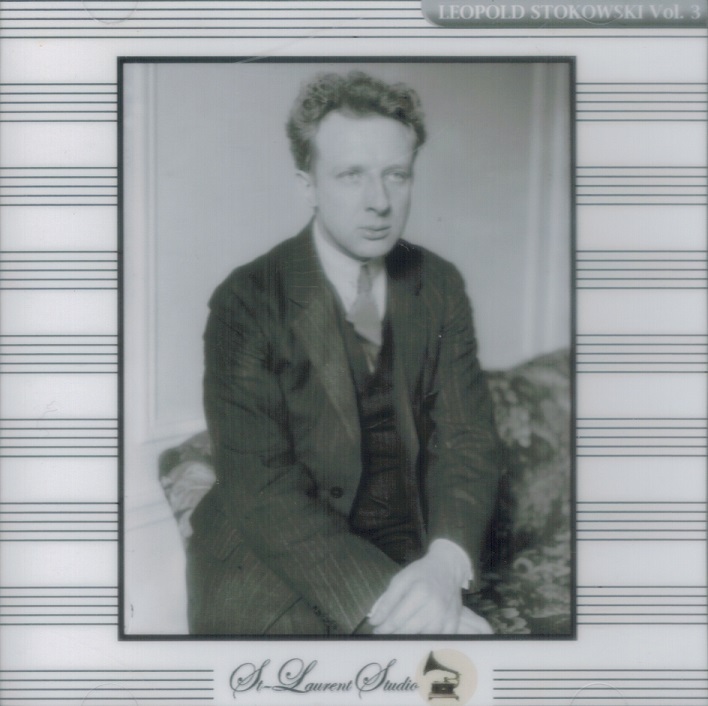 If Leopold Stokowski qualified as one of the marvels of 20th century musicmaking, and no one knowing the sum of his accomplishments could doubt that he did, he was also one of the more perplexing and least explicable symphonic conductors of his time. He had had hardly any conducting experience when, at 27, he took over the Cincinnati Symphony, but by the time he was 35, he was well on the way to international fame as a master orchestra builder, as a galvanizing personality on the Philadelphia Orchestra podium and as one of America's champion promoters of modern music. ….for three decades, from about 1915 to 1945, he was the epitome of conducting achievement and glamour, a man whose every move fed the publicity mill upon which he seemed to depend for essential nourishment. In 1916, Stokowski put both himself and the Philadelphia Orchestra indelibly on the musical map with the American premiere of Mahler's Symphony #8, in which a chorus of 950 members and an orchestra of 110 were used. In his heyday with the Philadelphia Orchestra, Stokowski demanded and was paid a very large salary and was openly criticized for being so money-minded. Some 40 years later, however, he was serving as music director and principal conductor of the American Symphony Orchestra for nothing. He had founded the orchestra when he was 80 and had paid for its first season of six concerts out of his own pocket. ….no major conductor of this century was more high-handed in the altering of a score than he. He was known to say, ‘That's a piece of paper with some marking on it. We have to infuse life into it’. His infusions often involved changes of orchestration, which he made freely….One of the longest-lasting controversies that grew up about the conductor had to do with the many orchestral transcriptions he made of Bach's organ works. He gave them full 20th century symphonic treatment and contended that Bach would have done so himself had he lived to see the development of the modern symphony orchestra. The fact that Bach might have composed an entirely different kind of music for such resources seemed to trouble him not a bit….So strong was Stokowski's impact upon the musical life of the nation in the 1920s and 1930s, however, that many organists cultivated a playing style that imitated Stokowski's symphonic transcriptions while ignoring the natural characteristics of the instrument for which Bach had composed the pieces….His ideas about interpretation were often intensely personal and led him occasionally into excesses that bordered on flamboyance. Stokowski was, musically, the very antithesis of Arturo Toscanini, with whom he shared the direction of the old NBC Symphony in 1942 and 1943. Toscanini, who came about as close as a conductor can to literal readings of scores, and whose interest in sound per se was not great, soon decided that Stokowski's views were too divergent from his to make their joint direction of one orchestra possible, and Stokowski was dropped. This came only two years after Stokowski's 29 year association with the Philadelphia Orchestra had broken off in bitterness. He was officially succeeded as musical director by Eugene Ormandy in 1938, but until 1941 he had gone back as a visiting conductor with special status. Despite this early fame, or perhaps because of the somewhat overbearing nature of it in its most extravagant days, Stokowski waited a long time for some of the opportunities that might have been expected much earlier. Stokowski's career seemed to go into a decline in the 1940s and it never recovered its original luster. For more than a decade he appeared to be searching for a base of operations. He organized the All American Youth Orchestra in 1940 and took it on tours of the United States and South America, but by the end of 1942 it went out of existence. In 1944, he had a hand in organizing the New York City Symphony at the City Center of Music and Drama, and he led the concert in March of that year that marked the opening of the City Center Theater, but he did not stay with the orchestra very long. In 1949 and 1950, he shared the direction of the New York Philharmonic with Dimitri Mitropoulos, but that experience did not result in a durable attachment with the Philharmonic. In these years, he not only lacked an orchestra of his own, but also was less in demand as a guest conductor than he had been. Thus, his acceptance of the post of musical director of the Houston Symphony in 1955 was in a sense a starting all over again. That orchestra was not considered a prize among first-rank conductors. Stokowski stayed with it, however, until 1960, when he broke his contract in protest over a matter concerning race prejudice….The orchestra management refused to allow white and black choristers on the same stage. Stokowski hoped that the orchestra would sue him for breach of contract so the matter would come out into the open, but that did not happen. He wrote a letter of explanation of his position to a major newspaper there, but the letter was never printed. Stokowski welcomed all races and women into the orchestras he founded, and from 1940 on he showed more concern than any other major conductor for the encouragement of young orchestral players. When he organized the American Symphony Orchestra, he said he was doing it to give experience to young performers, and the average age of its players was always notably young. In 1969, for example, the average age of the orchestra's 100 members was 34. Furthermore, of the 100, 34 were women, 4 were black and 4 were Orientals. One reason Stokowski was able to keep the orchestra young was that functioned as a kind of sophisticated pickup or freelance orchestra. Its players were, in effect, hired for each concert and had no permanent contracts. Stokowski liked it this way because it meant that he could replace players without difficulty whenever he wanted to. He was willing to audition anyone. ‘I give my number to my students’, he said, ‘and tell them to pass it around. All they have to do is telephone me for an audition’. When they telephoned, he would give them appointments to come to his Fifth Avenue apartment, and after hearing them play he would record his impressions of their work and add their names to his file. The young people generally liked to play for him. Stokowski was ‘a pioneer among conductors in his fascination with electronic media. He was experimenting with stereophonic recording possibilities years before stereo disks were put into commercial production, and in his 80s he was still vitally concerned with the improvement of recorded sound….His most spectacular pioneering foray into electronic sound came in 1940, when he participated with Walt Disney in the making of FANTASIA, an elaborate animated cartoon that illustrated a program of musical works conducted by Stokowski. These ranged from his transcription of Bach's Toccata and Fugue in d minor to Stravinsky's THE RITE OF SPRING, of which Stokowski had given the American premiere in 1922….Since he was especially concerned with acoustics, [he was] often reseating orchestras radically to get the sound he wanted…. In what was then an innovation for motion pictures, speakers were set up all around the inside of the theaters to surround audiences with the recorded musical sound of FANTASIA. It was the first important use of special amplification of a musical film soundtrack…. Stokowski seemed to take well to Hollywood and before long he was involved in a situation that fan magazines and gossip columns delighted in. He became a close friend of Greta Garbo, and for some months the conductor and the actress carried on a cat-and-mouse game with the press as they followed each other about Europe. The association did not last very long, but the conductor's marriage—his second, to Evangeline Brewster Johnson—ended in divorce in 1937. In 1945, Stokowski's private life was news again when he married Gloria Vanderbilt. He was 63 (58 by his count), and she was 21. They remained married for 10 years and had two sons, to whom Stokowski was very devoted and who became the objects of a bitter custody battle after their parents’ separation. Miss Vanderbilt, who later was married to Wyatt Cooper, won custody, with the provision that the boys visit the conductor on weekends and spend summers with him. 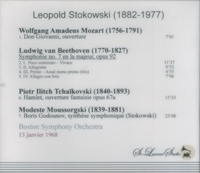 In 1960, when he was 78, Stokowski broke his hip while playing with his sons in his apartment. It Is said that he was teaching them the drop kick in football. This happened in December, and in February of 1961 he made his Metropolitan Opera debut [conducting TURANDOT] on crutches. In his later years, Stokowski was sensitive about his age, and the intensity of his feeling suggested that something more than vanity was involved. In addition to devoting the major portion of his work to young players, he wanted young audiences and actively sought social contact with young people. Stokowski's hands were as famous as his face, for he conducted without a baton, sculpting the air and shaping interpretations with motions at once graceful and forceful. At one time, during his years in Philadelphia, he had the hall darkened almost completely during concerts in order, he said, to focus the attention of the audience and the musicians directly on the music. Robert Jacobson in the Lincoln Center program reported that when Stokowski was asked to name the most memorable events of his career, he responded: ‘There was never anything like that. The love of music is a continuous enjoying of beauty and sound…It has been a continual effort to make music more alive so that it is not a mechanical reproduction of what is on a piece of paper, but a real expression, as it always was with the greatest artists’.